August 16 ~ 19, 2009, Harbin, China. Papers contributed to this workshop will be reviewed and selected for publication as a special issue or invited papers of International Journal for Energy Research. The papers published in this issue shold focus on the energy dimension of the NANOCOFC, e.g., novel energy applications, fuel cell performance, LTSOFC characteristics, etc. Pure material papers may fall outside the scope. The deadline for submission is on 15, March, 2009. Plenary lecture – the plenary lecture will be given by Nobel Laureate Professor Sir H. W. Kroto (Florida State University, USA). Invited talks – there will be a host of invited people from academia and industry. Posters – there will be poster display sessions in between the technical talks. We are looking to give out prizes for the best poster presentations. Oral contributions – people from academia and those from industry or those doing industrial work will be given the opportunity to give short 10-15 minute presentations on their most recent work. Exhibition – companies will have the opportunity to exhibit during this event which will attract people from all over the world. Interactive discussion forum – the conference will end with an interactive open discussion forum consisting of academics and industrialists all under one roof discussing issues relating to materials, processes and applications of nanotechnology. The abstract submission deadline is 30 March 2009. I look forward to receiving your abstracts and hopefully seeing you during MPA-2009. University of Minho, Guimaraes, Portugal during May 11-13, 2009. PPTC’09 is the first Portuguese conference on photocatalysis and it will be a milestone for all researchers who are interested in this area and its applications. We’ll meet in the wonderful city of Guimarães to resume in three days the major advances in this field, discuss the industrial applications, on-going investigation and also potential networking opportunities. Furthermore, this conference will coincide with a COST Action 540 »PHONASUM« PHOTOCATALYTIC TECHNOLOGIES AND NOVEL NANOSURFACES MATERIALS – CRITICAL ISSUES Management Committee meeting, therefore broadening the interest scope and networking possibilities. Over the last few years there has been a growing interest in the field of semiconductor photo-chemistry regarding the development of self-cleaning materials. Particular nanocrystalline thin films and nanoparticles are capable of acting as photoactive and photocatalytic materials, due to their intrinsic ability of removing pollutants in the gas phase or dissolved in water. The photocatalyst material plays an important role in the dissociation and mineralization of organic impurities on a particular surface, such as on glass, ceramic, metal or a polymer. The vehicle for this photocatalisation is simply solar light. Understanding the fundamental process and enhancing the photocatalytic efficiency of known catalysts has become a major research focus, bearing in mind industrial applications as materials that possess anti-fogging, self-cleaning or antibacterial activities for general purpose surfaces. SANTA CLARA, Calif.–(BUSINESS WIRE)–ENN Solar Energy Co., Ltd. announced today that it has produced China’s first 5.7m2 high-efficiency, tandem junction thin film photovoltaic (PV) panels using a SunFab™ Thin Film Line, rated at 60 megawatts per year, supplied by Applied Materials, Inc. Working together at ENN’s leading-edge facility in Langfang, China, ENN and Applied achieved this milestone just five months after equipment installation. These ultra-large PV panels are nearly four times larger than conventional modules on the market and use Applied’s innovative tandem junction technology to deliver significantly higher conversion efficiencies at competitive costs. ENN Solar Energy – a member of ENN Group – is a leader in the manufacturing of large-size thin film module products. The company produces and markets high performance silicon thin film modules of up to 5.7m2 per panel at low cost. Focusing on technology innovation and the environmental improvement, ENN Solar’s mission is to make clean renewable energy more affordable and available worldwide. Learn more at http://www.ennsolar.com. Applied Materials, Inc. (Nasdaq:AMAT) is the global leader in Nanomanufacturing Technology™ solutions with a broad portfolio of innovative equipment, service and software products for the fabrication of semiconductor chips, flat panel displays, solar photovoltaic cells, flexible electronics and energy efficient glass. At Applied Materials, we apply Nanomanufacturing Technology to improve the way people live. Learn more at http://www.appliedmaterials.com. On behalf of the organizing committee, I would like to invite you to participate in the International Conference on Nanoscience and Technology, China 2009 (ChinaNANO 2009) which will be held between September 1-3, 2009 in Beijing, China. This is the third conference following the successful ChinaNANO 2005 and ChinaNANO 2007 held in 2005 and in 2007 in Beijing, respectively. ChinaNANO 2009 is intended to stimulate discussions on the forefront of research in nanoscience and nanotechnology. The conference will focus on nano-information materials, nano-energy and environmental materials, nanodevices and sensors, nanomedicine, nanopharmacy and biomedical engineering, nanofabrication and nanometrology, characterization of nanostructures, nano-optics and plasmonics, as well as modeling and simulation of nanostructures. We sincerely hope that the scope of the conference will serve the interest of the scientific community, as well as the industry and the general public. I wish to extend my welcome to all participants and sponsors of the event. NanoteC is one of the longest running series of international nanoscale carbon conferences in Europe (since 1998). It brings together scientists working with nanoscale carbon materials: nanotubes, graphene, diamond- and fullerene-related nanostructures. While each of these materials attracts its own dedicated community of researchers, NanoteC draws on common themes and allows researchers to share insight into this unique element at the nanoscale. Elemental carbon shows remarkable variety in properties via simple covalent bonding, however other systems (for example containing nitrogen or metals) are becoming important and provide alternative components with unique mechanical and electronic properties. Nanotechnology requires an understanding of these materials on an atomic level and this will be the central theme. The NanoteC conferences are renowned for their relaxed and friendly atmosphere, with emphasis on discussion and participation. We endeavour to achieve as much student participation as possible, and we anticipate that the keynote talks will be strongly influential on the next generation of nanotechnology scientists. Contributed talks are also mainly attributed to young researchers. This year NanoteC09 will be in Brussels, Belgium, with 120 to 150 participants from around the world, 12 sessions (non-parallel) with about 10 keynote and 30 contributed talks, as well as a poster session, with posters available for discussion throughout the conference. The conference begins at midday Wednesday 26th August 2009 and finishes midday Saturday 29th August. Buffet lunch is available on the 26th. All lunches are included in registration fee, as well as dinner on August 26th and the Conference Dinner on August 28th (Dinner on August 27th is not included). Round table debate: a general and open discussion will be held on themes such as carbon nanotube and nanocomposites production, nanocarbon characterisation, ethics and communication, etc. These are intended to give new people to the field a rapid introduction, and those more established to explore a topic in some detail together. Breaking News Lectures: If presenting a poster, attendees may register for a “breaking news” slot; depending on demand there will be programme slots available for particularly new and exciting results. The conference will also incorporate a growth and synthesis session, as well as a microscopy session organised in cooperation with the Royal Microscopical Society. It will also include a science communication session, where the crucial issue of communication and public dialogue will be discussed. Int. Conference on Nanoscience and Nanotechnology 2008, guest-edited by Paul Mulvaney. Advanced Biomaterials: A new section of Advanced Engineering Materials starting in April 2008! Click on the covers to find out more about our must-have materials science journals. Publishing a mixture of reviews and rapid communications, Advanced Materials is one of the most influential journals in the field. Supporting Information for selected articles is available free of charge. Links are available from the table of contents and from the abstract page (near the full-text links). Otherwise, please check the “Additional Material” section of the abstract and HTML full-text pages. The NNI-sponsored Workshop on Nanotechnology-Enabled Sensing is part of a series sponsored by NNI participating Federal agencies. The workshop will be held May 5-7, 2009 at the Sheraton National Hotel in Arlington, Virginia. Leading experts will assess the nanotechnology research community’s long-term goals and key challenges in the area of sensing. Please note that advance registration is required. Every week the NNI will be updating the latest nanotechnology and nanoscience-related funding opportunities drawn from announcements from agency websites, grants.gov, Commerce Business Daily and other government databases. Check out the latest nanotechnology articles in this edition of the Nano Flyer. Please note: Below are institutions involved in nanotechnology research and/or information dissemination. Unfortunately, it is not possible for all institutions involved in nanotechnology to be listed on this page. The Tesla coil is one of Nikola Tesla’s most famous inventions. It is essentially a high-frequency air-core transformer. It takes the output from a 120vAC to several kilovolt transformer & driver circuit and steps it up to an extremely high voltage. Voltages can get to be well above 1,000,000 volts and are discharged in the form of electrical arcs. Tesla himself got arcs up to 100,000,000 volts, but I don’t think that has been duplicated by anybody else. 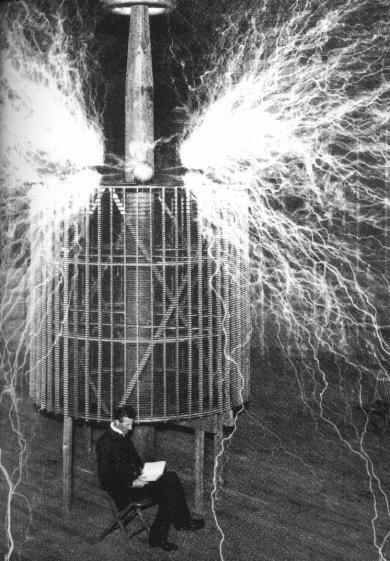 Tesla coils are unique in the fact that they create extremely powerful electrical fields. Large coils have been known to wirelessly light up florescent lights up to 50 feet away, and because of the fact that it is an electric field that goes directly into the light and doesn’t use the electrodes, even burned-out florescent lights will glow. Nanoporous membranes. Some of the most interesting applications for nanoporous membranes come from the ability of nanopores of certain sizes to let some substances pass and others not . . .
this is a really incredible explanation and covers some of the exciting possibilities with nanoporous materials science. – By Cientifica. Available online 11 February 2003. We present a procedure for high volume fabrication of nanopore membrane chips, combining low cost hot embossing for nanopore replication and conventional photolithography for manufacture of the membranes, alignment marks and break lines. The embossing masters are fabricated by electron beam lithography allowing customisation of the nanopore design. Nanopore membrane chips containing four membranes were fabricated and three of the membranes were structured with arrays of pores with three different diameters. Several different nanopore periods were tested. For pillar sizes in the embossing master of 460, 250 and 95 nm, optimization of the pattern transfer process resulted in nanopore sizes of 550, 330 and 140 nm. For the minimum periods employed for these three pore sizes of 1000, 500 and 300 nm, respectively, the membranes were found to be stable. This fabrication technology opens the way for high volume batch processing of nanostructured membranes, facilitating new avenues for research and technology. Using different imprint systems and process conditions, the impact of the visco-elastic properties of polymers on the fidelity of pattern transfer in hot embossing lithography has been studied. The flow behaviour of the polymer, which is a highly viscous liquid at the investigated temperatures, has been shown to be the limiting factor in the replication of micrometer sized features, but does not adversely affect nanometer structuring. This is explained using hydrodynamic considerations. The effects during filling of the cavities formed between stamp and substrate are reported, and explained in accordance with recent publications, where two different types of filling mechanisms have been discussed. Large recessed stamp areas turn out to be much more critical for the process, as they may act as mask defects. They will not restrict the applicability of hot embossing lithography in practice when appropriate imprint conditions are chosen, which have to be enabled by the equipment. We present a technology for the fabrication of three dimensional microfluidic channels in optically transparent substrates consisting of polymers with different properties. The microstructures are fabricated using polymer replication techniques with a view to the production of microfluidic devices with characteristics suitable for biomedical applications. The replication processes can be used to fabricate large numbers of highly precise, complex microchannels via replication from a single similarly precise master, containing microstructures fabricated from silicon-based materials using lithographic micromachining techniques. Silicon oxide and silicon nitride-based masters have been used, due to their anti-adhesion properties, to produce microchannels, in the transparent polymers, that are suitable for channel profiling measurements and optical studies of fluid flow. Strong PolyMethylMetAcrilate (PMMA) resist recoveries, occurring in the centre of micro-scale structures replicated by hot embossing lithography (HEL), have been evidenced after the de-moulding stage. A statistical study by atomic force microscopy clearly reveals that, for a fixed pattern size, the heights and the widths of these recoveries decrease when the imprint temperature goes up and increase with the imprint force up to a critical value before vanishing. It also shows that these resist recoveries increase with the pattern size. This phenomenon is explained qualitatively and quantitatively as a relaxation, during the de-moulding stage, of the elastic stresses stored by the PMMA resist which could not flow during the imprint stage. Ferromagnetic/antiferromagnetic Co/NiO films were patterned into sub-micrometric dots by hot embossing lithography. The magneto-optical Kerr effect study of these dots shows that when the dot size decreases, the coercive field Hc increases and the exchange bias field HEB decreases. We demonstrate various nano- and microstructuring possibilities of electroforming in combination with hot embossing lithography. Periodic structures down to 120 nm and feature sizes <50 nm have been replicated. Electrode devices were fabricated with various line widths and heights. The electrodes have a length of several mm, are defect-free over an area of some square mm and have a gapwidth down to 50 nm. Overplating provided a means to increase aspect ratios and decrease gapwidths. Daughter molds were fabricated by backplating structures, forming a substantial supporting substrate. The replicated stamps could be produced with nanoscale fidelity. This is an AC electric generator which lights up a tiny incandescent light bulb. The generator is made from a hollow-ended cardboard box with a nail through the center. The box has many turns of fine copper wire wound around it, with four large magnets clamped around the nail. When the nail and magnets are spun fast by hand, the little light bulb lights up dimly. I wrote this article because I found lots of projects for making a simple electric motor, but nobody gave the secret for making a generator. Well, here it is: use strong magnets, lots of fine wire, and a special light bulb which only needs 1/2 volt. Also, don’t bother making a “commutator,” just hook the wires directly to the bulb. It’s much simpler that way, but the generator will produce AC (alternating current). Before you start, here are some notes: you must use a special light bulb. Normal flashlight bulbs will not work. Also, you must use the large, strong magnets shown in the parts list. Smaller magnets won’t work. The wire must be #30 gauge or smaller. Also, you can improve the generator if you buy lots of extra kits of wire and wind it on the cardboard, since the bulb will light up even when the generator spins slowly. Three kits of Radio Shack wire is expensive, it’s cheaper to order just one $1.50 solenoid, but you’ll, need vise-grips pliers to pry apart the steel frame and remove the spool of wire. While running the tech shop at the Museum of Science in Boston, I was working on new ideas for exhibits for the Electricity Hall in 1988. I knew that the Exploratorium had an electric generator exhibit where the museum visitor would yank a plastic-embedded coil plate through a row of huge magnets (magnetron horn-magnets from a military radar.) Doing so would light up a small bulb. I just knew that there HAD to be a way which uses more common magnets. So I stacked up a pile of 3″ loudspeaker magnets (those black donut things) and waved it past various coils. Finally I wound about five pounds of #26 wire around a ring of nails pounded into a board, hooked up a #49 light bulb, then moved the stack of speaker magnets in and out. This easily lit up the bulb. Around 1994 I was thinking about the ultra-simple electric motor which later became known on internet as the “Beakman Motor.” Wouldn’t it be cool if kids could also make an electric generator that simple? But it should be possible with parts from a Radio Shack store, since Radio Shack had the special light bulb as well as magnets and spools of electromagnet wire. After a few hours of experimenting I fould that I could just barely light up the 20 milliamps bulb by using a single spool of #30 wire from radio shack. But the wire had to be VERY close to a fast spinning magnet, and the magnet had to be composed of four powerful ceramic magnets in a stack. WARNING: Keep the magnets away from computers, disks, videotapes, color TV sets, and from wallets and purses containing credit cards. Try this: Keep the generator far from your color TV, turn on the TV, start spinning the nail so the magnet is spinning fast, then bring the generator about 2ft away from the TV screen. DON’T BRING IT CLOSER!!! Keep spinning the magnets, and you’ll see a cool wobbling effect in the TV picture, along with some color changes. The field from the magnet is bending the electron beam that paints the picture on the screen. Be careful, if you bring the magnet about 15cm away, the iron sheet inside the TV picture tube will become magnetized and the distorted colors will be permanent. All the directions for this project are on the site link above and it is really thought-provoking and inspiring, actually. Exhibition Space: 1000 Euros, including one free non-residential registration. Conference Supporters: Conference supporters will be acknowledged on the conference website and also via either inserts in delegate conference packs or space within the abstract booklet. Key sponsors will optionally also appear on the conference bags. Poster Prize: We would also be interested to hear from potential sponsors for the conference Poster prize. The slow-turning vertical-axis design is most efficient in gusts of 6 to 20 mph, so it’s ideal for relatively low-wind areas like western Michigan, where he lives. You can download plans at windstuffnow.com to build your own Lenz2. It’s not a quick weekend project, but once it’s up and running, paying the electric bill should be a breeze. Cut teardrop shapes from plywood, connect with four-foot rods, and cover with aluminum. Glue magnets to two steel discs, tape copper-wire coils to a plywood disc (the “stator”), and slide all three discs over the shaft. Clamp both ends of the shaft to the rectangular frame. Weld the wings’ arms to the bottom disc on the alternator, as well as to a steel disc at the top of the turbine. Attach cables to the frame arms and stabilize with sandbags. Wire the alternator to a rectifier, a device that converts the power from AC to DC, and connect it to the batteries. It takes four to six hours for Lenz’s turbine to fully charge his bank of eight batteries. Another Build: The $30 Open-Source Turbine Go to velacreations.com to find instructions for off-grid DIY’er Abe Connally’s Chispito wind generator, a horizontal-axis-turbine design that more than 200 builders have built and helped perfect. Made entirely of salvaged parts, such as a treadmill motor and recycled sewer pipe, the Chispito can generate 100 watts in a 35mph wind. And if you’re able to find all the supplies, you can build it for less than 30 bucks. Covers solid-state chemistry, both inorganic and organic, and polymer chemistry, especially as directed to the development of materials with novel and/or useful optical, electrical, magnetic, catalytic, and mechanical properties.